Woodland Park Zoo is delighted to announce the good news that the highly threatened mountain gorilla has reached the point in its recovery that its status has been downgraded from Critically Endangered to Endangered. The decision was made by the International Union for Conservation of Nature (IUCN), the international organization that tracks the conservation status of animal and plant species. The decision shows the slow but steady increase in the population of this great ape due to concentrated protection efforts over the last few decades. There are still only about a thousand mountain gorillas left in the wild, found in a few scattered populations in the mountains of Uganda, Rwanda, and the Democratic Republic of Congo (DRC) in central Africa. The mountain gorillas have been facing threats from poaching, habitat destruction, and repeated civil conflicts that have forced local people into protected areas and led to breakdowns in protection efforts. While the mountain gorilla’s new status is a real conservation success story, the population is still under threat from human pressure, climate change, and even Ebola. Other populations of gorillas are still declining precipitously. Woodland Park Zoo supports the Dian Fossey Gorilla Fund and their long-standing work protected the mountain gorilla. Woodland Park Zoo also supports the Mbeli Bai Gorilla study in Nouabale-Ndoki National Park in the Republic of Congo, which now holds more than 62% of the world’s critically endangered Western Lowland gorillas. You can help support these projects and help save gorillas just by recycling this holiday season. Are you buying a new cell phone or handheld device for yourself or as a gift for someone else? Instead of tossing your old ones, consider dropping them off at Woodland Park Zoo. We partner with an organization called ECO-CELL to keep them out of landfills. ECO-CELL extracts mineral ore from these devices to reduce the demand for unsustainable coltan mining in the Congo that destroys habitat for critically endangered gorillas. The resale value for these minerals is reimbursed to the zoo and we use those funds to support our conservation work in the field. If you want to drop off any of your old devices, including cell phones, smart phones, iPods, iPads, tablets and MP3 players, you can find ECO-CELL receptacles located at both zoo entrances. In addition, the Seattle law firm Lasher, Holzapfel, Sperry & Ebberson is helping save gorillas too! For every device we receive Lasher will donate $1 towards gorilla conservation. 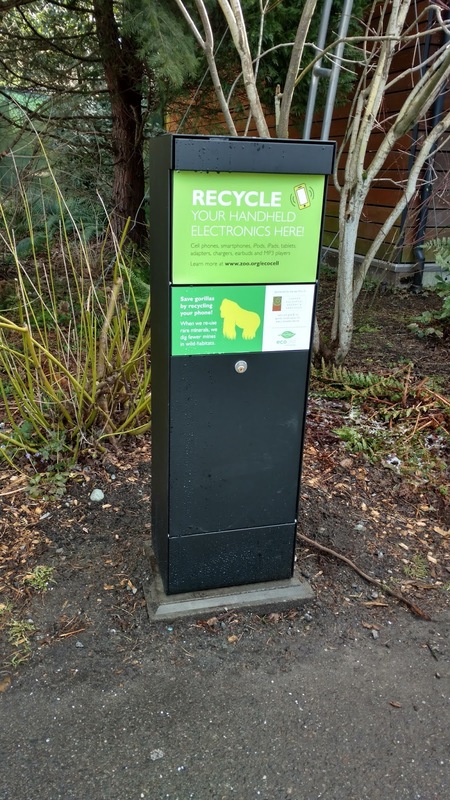 ECO-CELL drop-off bins are at both Woodland Park Zoo entrances. Photo: Elizabeth Bacher, Woodland Park Zoo. If you're stopping by don't forget to visit our resident gorilla families here at the zoo, including our new silverback, Kwame. He is forming strong bonds with the females in his group, including Akenji, Uzumma, Nadiri and little Yola. The family is still getting acclimated to the public part of their exhibit together, so the times you can see them might vary depending on the day. 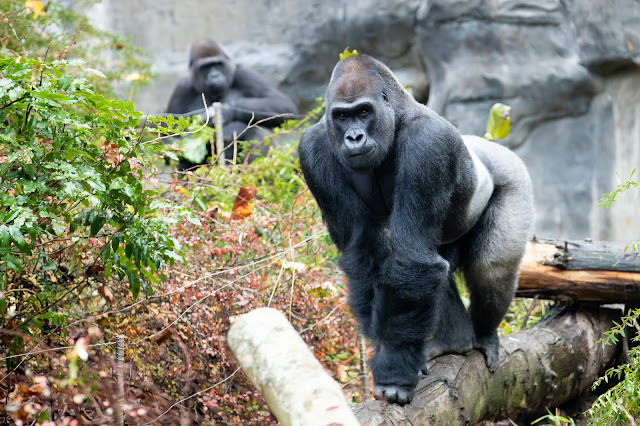 To learn more about gorilla conservation and Woodland Park Zoo, please visit https://www.zoo.org/wsf/africa. Thank you for caring about gorillas and other endangered species as much as we do.